Seventh October is the anniversary of consecration Shirdi Baba statue in Shirdi. It was a huge turning point for Shirdi when the Shirdi Sansthan decided to put a statue on 7th October`1954, Vijayadashami Day - 36 years after Baba's Mahasamadhi. at the Bombay Docks but for whom or why, nobody seemed to know Thus, in the absence of a claimant, the dockyard authorities auctioned it off and the purchaser later offered it to the Shirdi Sai Sansthan. Impressed by the quality of the Italian Marble, the Shirdi Sansthan planned to use it for an Idol of Sai Baba. So they gave Shri.Balaji Vasantrao Talim - a sculptor from Bombay, the humongous task of sculpting Baba's Idol. Meticulously, Shri.Balaji Talim got his tools 'made to order' from iron-smiths and carpenters started off by first making a Model of Baba using Mud Clay. But it was difficult for Shri.Balaji Talim to make the statue in its exact likeness without the intricate details of the physical characteristic's of Baba's face, to profile which he only had Baba's one black & white photograph. Therefore, he prayed saying "If Sri Sai Baba gives me darshan while making His Statue, the Statue will be worthy & the devotees also will have feelings of devotion". And sure enough one early morning, around 07:00 am when Shri.Balaji entered his Studio, he saw a bright light even before he could switch on the Lights. Baba had appeared in the Light and given Darshan to him in the studio . 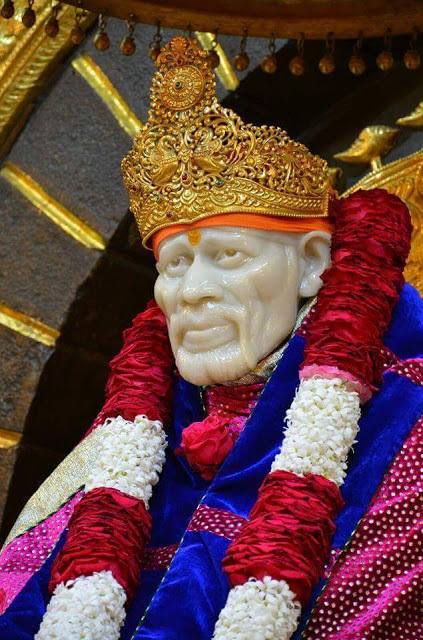 Baba remarked on Talim's difficulties and showed him his Face from various angles, encouraging Talim to study it thoroughly and remember it well. The Shirdi Sai Sansthan immediately approved this Mud Statue of Baba, on the basis of which the present Italian Marble Statue of Sai Baba was carved and installed in the Samadhi Shrine. 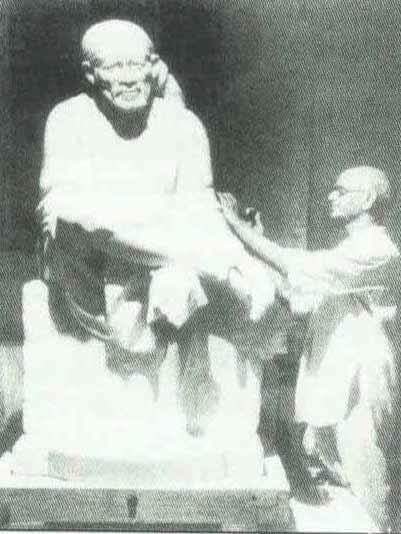 In 1954, while working with his workers at the finishing stages of Sculpting the almost ready Marble Statue of Sai Baba, Shri.Balaji Talim found an Air Pocket in a small additional portion below the Left Knee of Baba's Statue, which had to be removed. It seemed dangerous, as in removing an Air Pocket from a Finished Statue, there was every risk of the entire portion coming down, thus leaving the Statue Khandit (Broken), which therefore could not be worshiped at all. So the work stopped and Shri.Balaji Talim hesitated to strike and chisel out the additional portion. but the workers refused to do so fearing that the entire knee portion would just drop out. Eventually & quite nervously, Shri.Balaji Talim took the chisel & hammer himself and while praying "Baba, help me" gave a small stroke, touching the additional portion of the marble below the Left Knee. And to his great surprise, only the additional portion of the marble came down leaving the rest of Baba's Statue intact. Seeing this, tears rolled down his eyes and he prostrated before Baba, started dancing and distributing sweets to all..
As, he experienced such a wonderful miracle of Sai Baba. The 5' 5" finished Idol of Sai Baba was taken throughout the village with pomp & ceremony. Baba's Idol was so Life like that devotees like Swami Sri Sai Sharanananda & Laxmibai, who had personally been with Baba, felt as if Baba had come back alive in the form of his Idol. On 7th October`1954, Vijayadasami Day, this life like Marble Statue of Sai Baba was installed on the platform of the Samadhi Shrine's western side behind Baba's Samadhi and the due formalities of Prana Pratistha were done by Swami Sri Sai Sharanananda who had met Baba before His Mahasamadhi. At the time of preparation of Baba's Statue, one day Baba gave Darshan to Shri.Balaji Talim and said, "Finish the work and you will not do any other Idol in future." So Talim did not prepare any other Idol since then and finally at the age of 82 on 25th December`1970 he breathed his last.